Looking for the best gopher poison in 2019? Then you're in the right place! In this guide, we’ll show you how to pick and choose the best poison to permanently kill gophers in your yard so they don't come back. Our top pick is the Giant Destroyer! 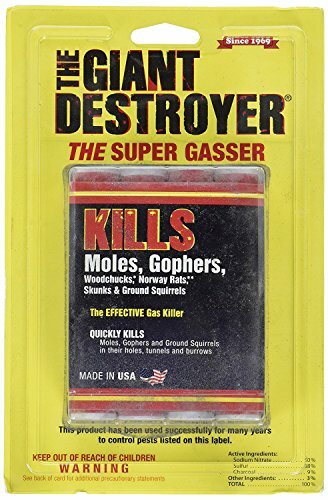 This product gases the gophers right where they live, turning their tunnels into miniature gas chambers. Once you light the fuse and stick it in their tunnel, cover it up and their fate is sealed. The nice thing about this method is its safety. It doesn't pose a risk to pets and children unless it's lighted, and even then it's only dangerous in confined spaces. Outdoors, it dissipates before it can cause any harm. Any time you can combine an effective gopher kill with child and pet safety, we're all for it. In this category, this is the best one at accomplishing both. How To Properly Use Gopher Poisons? Is Gopher Poison Safe Around Pets And Children? Short on time or just want a quick answer? Check out our below list for a summary of our results. Keep on reading to learn more about traps and gophers! Want to skip all this research and just hire a decent exterminator for your gopher problem? 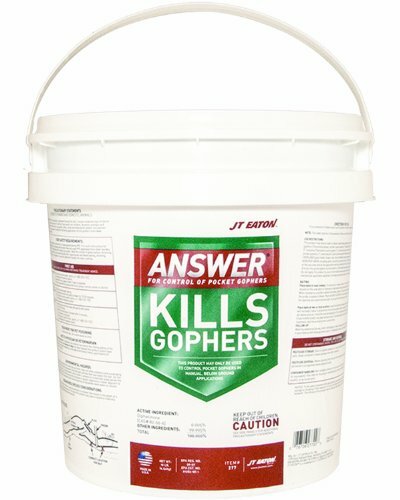 How To Choose The Best Poison For Gophers? 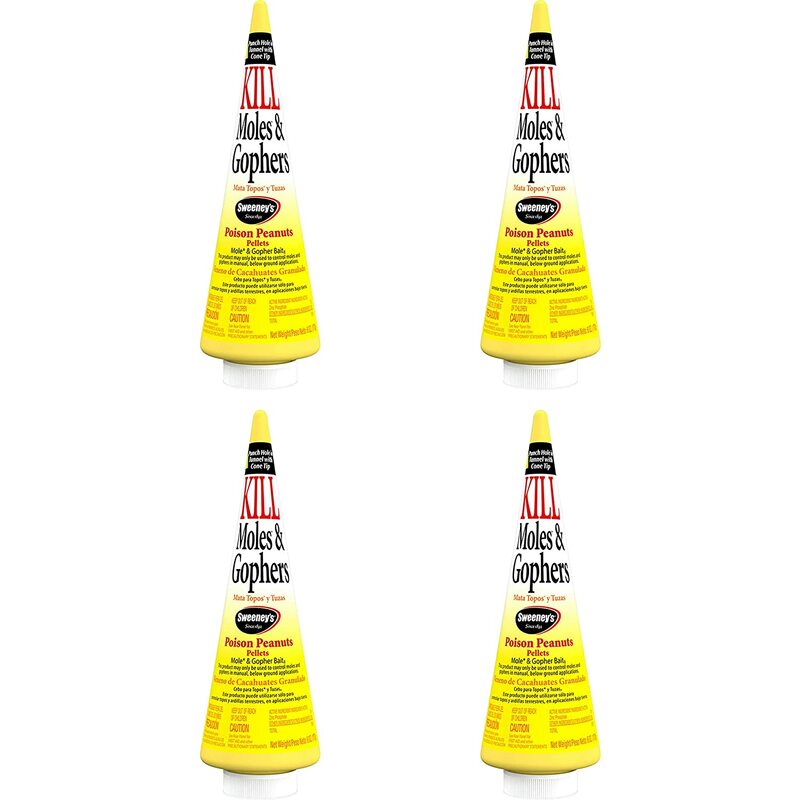 The first thing a good gopher poison should have is an attractant. If they're not attracted or drawn to it, it won't matter how good it is. They have to eat it for it to work. But your bait has to compete with the natural food they're already finding. Remember, they wouldn't be in your yard if they weren't finding something to eat. Read Also: How to pick the best bait for gopher removal? You'll have to be patient after you put the bait out. If it has a sufficiently good attractant on it, eventually they'll find it and eat it. “Eventually” is why using poison is slower than trapping. The second thing you'll want to consider when purchasing bait is how much is needed to kill each gopher. The “hotter” the product, the less it will take to kill them, which means the less of it you'll have to use at any one time. This translates into saving money. And finally, how fast does it work? Most poisons will kill the gopher within 24-hours of ingestion, sometimes less. A slow, drawn-out death will alert any other gophers in the area to the fact something is going on. They'll become very suspicious of anything new or unusual, including the bait you're putting out. If they start avoiding it, the game is up, so make sure the poison you choose works fast. Read Also: What's the best trap to catch a gopher? Gopher poison works best when placed in gopher tunnels so the amount of physical effort is identical to setting traps, although without the worry of a trap snapping your fingers! Most of today's poisons are non-toxic to the touch, so you don't even have to wear gloves when handling them. The Colorado State University Extension office has some very good advice on how and where to place the poison once you've got it. Once the poison is in place, it can remain active for weeks. This creates a 24/7 protective barrier around your property. Gophers moving into new territory are doing so because they ran out of food. Consequently, they'll eat anything they encounter, including any leftover poison, which is of course good for you!. According to the researchers at Oregon State University, baits for moles and gophers often contain zinc phosphide. When a mammal such as a gopher (or your dog) eats the poison, their stomach acid reacts with it to create phosphine gas. This gas is highly toxic to rodents, moles, dogs, cats, general livestock, and yes, people. Children and small pets are especially sensitive to zinc phosphide poisoning. If they ingest any of it, induce vomiting and get them to a doctor right away. The doctor will probably want to follow up with activated charcoal. Because it is so dangerous for pets and children, keep the container safely out of reach. A lockable drawer or cupboard is best. Only put out the minimum amount needed to kill the gophers so there's none left over for them to get into. If your dog likes to dig, you may have to put him on a lease until the gophers are dead. Instruct your children on the dangers associated with the gopher poison, then keep them away from the yard where it's being used. As long as these kinds of common-sense precautions are taken, the bait shouldn't be a problem for you. 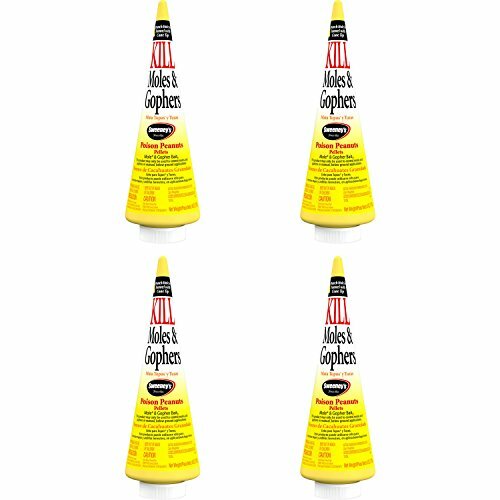 Here are the 4 gopher poisons we reviewed. Our #1 pick went to the Giant Destroyer, but some of the others may be better suited to your particular needs. The Answer Gopher Bait has a different active ingredient than the rest of them and might be good if your gophers have developed a bait aversion to the zinc phosphide poison. Not all of these poisons require protective equipment, but you should exercise caution with any poison. To begin with we have the Giant Destroyer. This gas bomb fills the gopher hole with gas for up to two minutes before it goes out. Light the fuse, shove it down into the tunnel, then cover the opening with dirt or whatever else you like to trap the gas, and the gopher, inside. The gas will still be operative long after the two minutes are done so make it as airtight as you can. Although this product is technically a poison – gas, in this case – it's not a bait. This is a plus because you get to decide when you want to kill the gophers instead of waiting for them to eat a bait before they die. This makes it safer for pets and children than a normal bait too. You'll probably have to use more than the package recommends due to the vagaries of the soil which might let some gas leak out, but you won't have to clean messy traps or dispose of dead animals. The active ingredient in this block bait, Diphacinone, is an anticoagulant which causes internal bleeding when ingested. It is highly toxic to humans and other mammals by inhalation, dermal absorption, and ingestion. This means you need to wear gloves when handling it and be careful not to inhale the fumes. Personal Protective Equipment, PPE, is called for in this case. This bait kills the gophers very quickly once they eat it, usually in less than 10-hours. It's equally dangerous for pets and children, use care when handling it and dispensing it. After placing it in the gopher tunnels, put a heavy weight over it to prevent your dog from digging it up. If that's not possible, put your dog on a leash so they can't reach the baited area(s). This poison also a strong secondary effect. If your dog eats a gopher killed by this bait, your dog could become extremely ill, but it may not be strong enough to kill them. When in doubt, take them to the vet. These poison peanuts from Sweeney's will kill the gopher within hours of being eaten. These pellets contain zinc phosphide, so once gophers eat them, they're dead. Use a long stick to poke around in the ground near the tunnel opening until you find a place where it goes in easily. This is where you want to poke these peanuts down into the ground using a funnel. For the best results, once the bait is in place, cover up the tunnel entrance and the hole you made. The gopher will interpret this as an invasion of his territory. He'll come to re-open the tunnel and find the bait. You'll need to exercise some patience with these pellets. Bait every tunnel you can find, wait a few days then bait them again. Eventually, they will find them and eat them. Using cracked corn for the attractant, this 2% zinc phosphide bait has a very good acceptance rate on gophers and moles. That means they like it and eat it. It only takes one teaspoon of this granular bait to kill gophers. Because it's granules rather than pellets there isn't as a great a chance of your dog getting eating of a lethal dose of it. Dogs are sloppy eaters and granules are very difficult for them to manage. This is a nice – but probably unintentional – safety feature on this bait. Find the active tunnel then poke a hole down into it 1-2 feet away from the opening. Pour a teaspoon of granules into the tunnel then cover up the hole and the main opening. After a day or two, bait it a second time to make sure you got the gopher. There are plenty of gopher poisons on the market to choose from, several with different modes of action as well as some fumigants. Our top choice went to The Giant Destroyer. It is quick and effective and lets you pick the time to kill the gophers, instead of waiting for them to pick up and eat a piece of bait. Nonetheless, our second pick was the Answer Gopher Bait. Instead of zinc phosphide, it utilizes a non-standard active ingredient, Diphacinone, which might appeal to gophers who have developed a bait aversion to normal baits. If other baits don't seem to be working, and you're reluctant to use gas, Answer might be the answer (no pun intended). Curious about other gopher related articles? Check out our other detailed guides to help you deal with your pest problems.